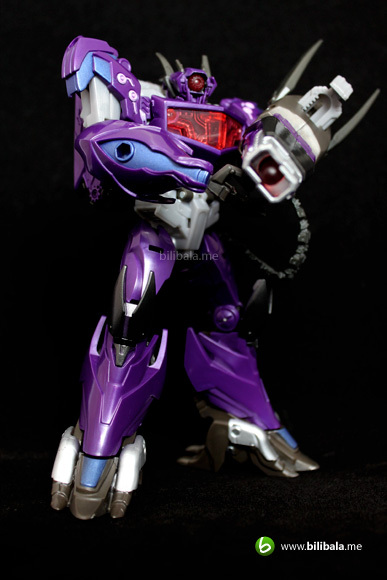 Shockwave, a mad scientist behind Decepticon troops, possibly the most anticipated Transformer Prime toy. 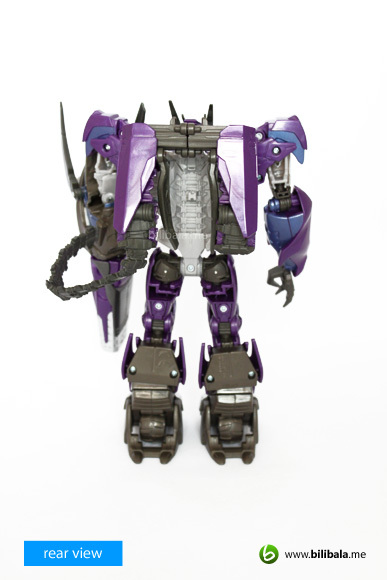 With rave reviews and almost perfect show accurate make him a seek after for the Prime fan. Unfortunately enough, he doesn’t stay long on the shelves in my local toy shop even for a Hasbro version. If you are planning to grab the Takara version, one has to go thru any 3rd party sellers who fortunately are selling at great prices. 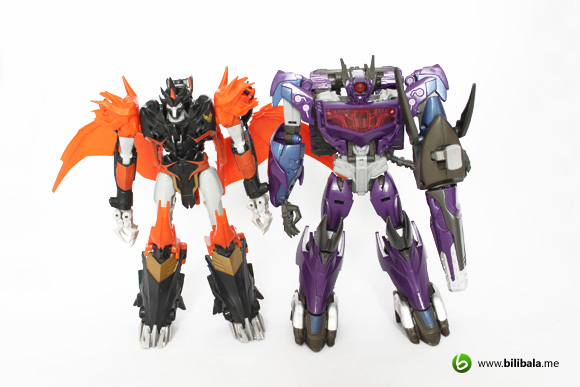 Of course, I skipped Hasbro version altogether and grab the more expensive Takara version. Just 2 words for it: No regret! 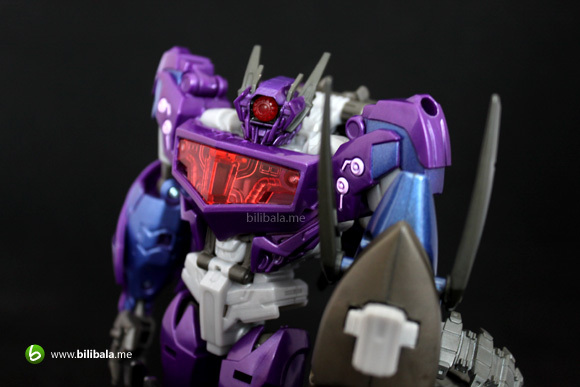 Read on to know more about what this Takara has to offer to its fan! 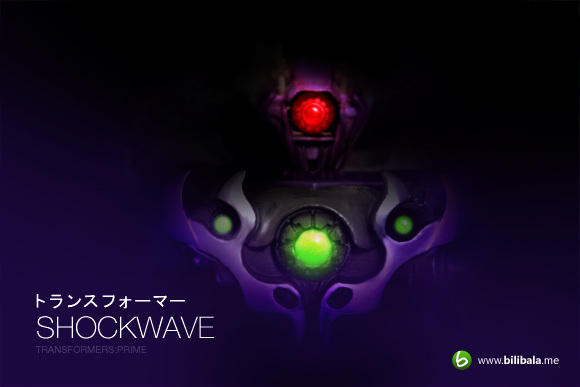 They actually don’t call Transformer Prime in Japanese. 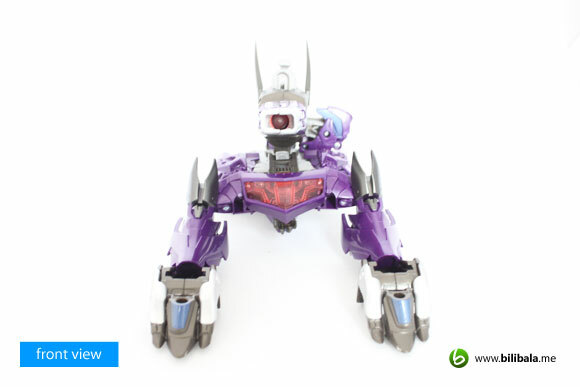 They go with the name with Transformers Go with an entire new story line as well as some new robots to boast about. However, there are some fairy amount of familiar faces which are still appearing in the new Japanese version. 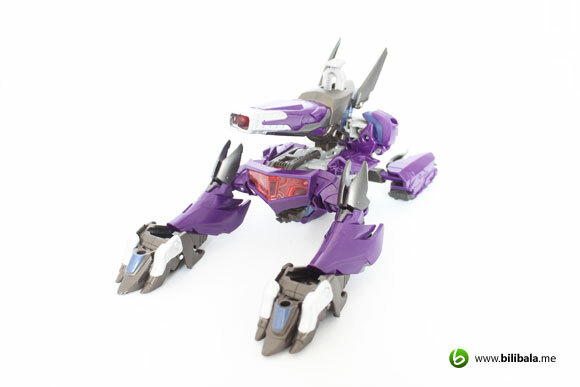 For the toy version, you’ll be expecting they are releasing a more premium version of the Hasbro Transformer Prime Beast Hunter. 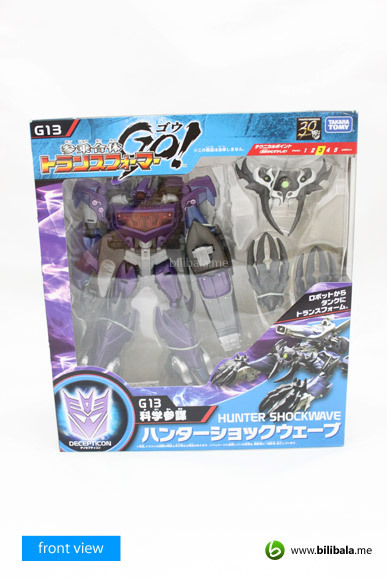 Shockwave, or being called Hunter Shockwave, in Transformers Go series is one of the wave 2 released voyager class (alongside with the favorite Optimus Prime) featuring a totally new box art design. 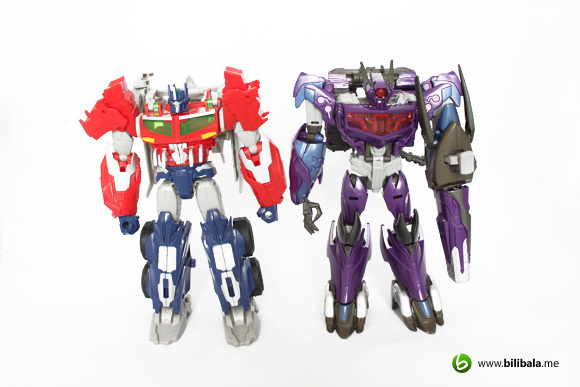 Noticeably, there’s a 30 anniversary logo on the top right to commemorate the thrilling 30 years of Transformer history. Of course, all the language being used is Japanese and I can’t really understand any of it. 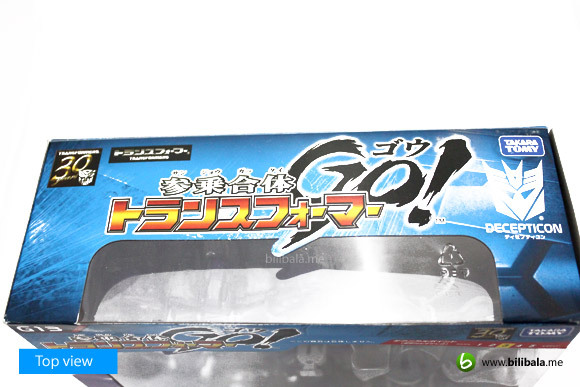 But it’s quite interesting to see the approach of the Japs on their packaging which features a bit more of their upcoming figures of the same line. The familiar chart/technical data can be seen as well. A bigger logo outshouts from the rest on the top of the package. 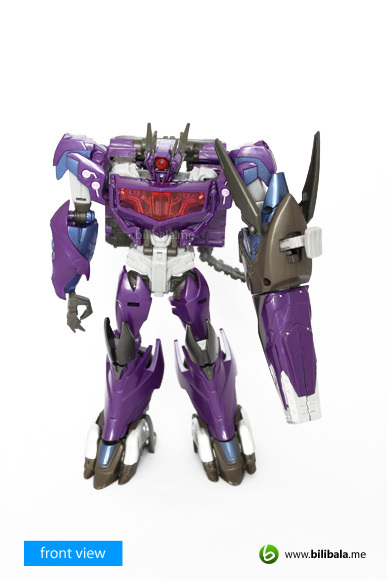 The new alt mode of Shockwave will be a cybertronian tank. 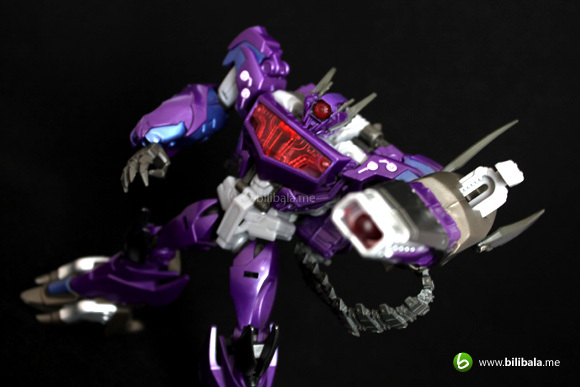 Not the first time he appeared in the form as a tank and if you can recall, Dark of the Moon Shockwave has similar concept of being a cybertronian tank. Anyhow, the first impression of this tank, it reminds me of the Thundertank from Thundercat with 2 legs being the front of the tank. True to the form as in the series, I can say it is very much accurate with bits and details being cast. 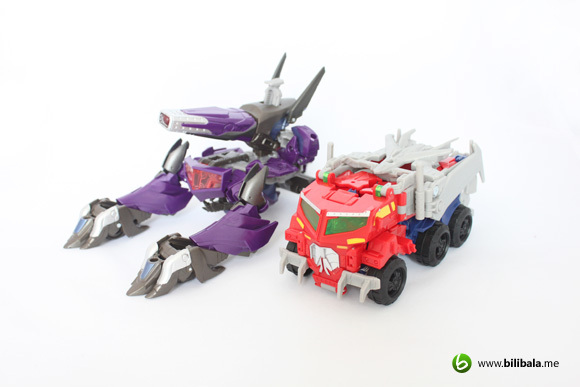 One thing that is far superior from Hasbro for this Takara version is the plastic material and paints they are using. 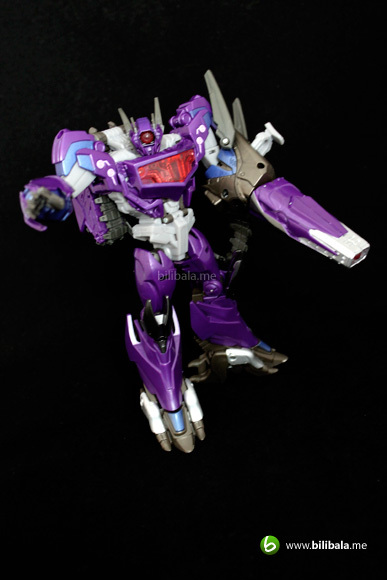 First thing first, Shockwave is NOT in metallic paint or some sort. It does being perceived that he has a metallic paint application. 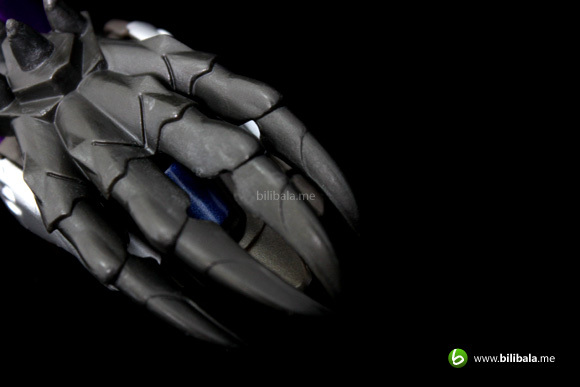 In actual fact, Takara is using different type of plastic which is shinier, darker hued and definitely looks much nicer! 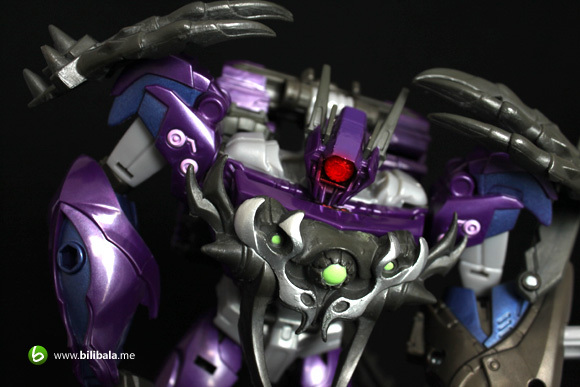 With the help of some minor metallic paint applications, it makes him an attractive beast! 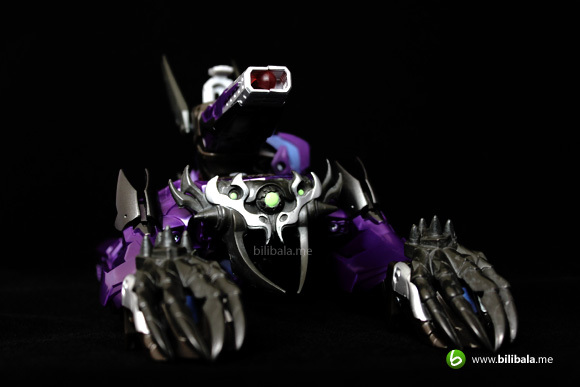 Personally, I dont really much fancy with the Cybertronian tank idea. Don’t get me wrong about not admitting it is show accurate. 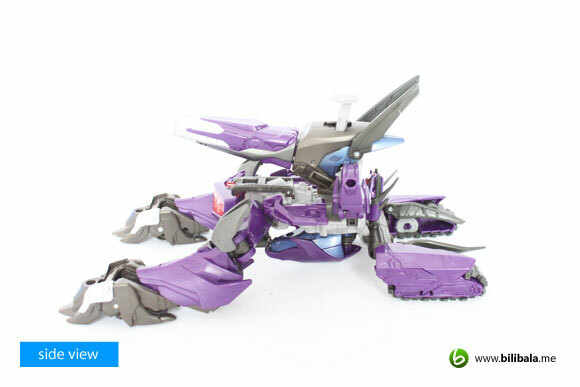 Just that the design doesn’t really impress me and to have to think of Shockwave being laying down with 2 legs spread apart is awkward. Well, pure personal preference. The back section has very minimal detail to say. The tank does come with non-movable treads. The only things that assist the tank to move are wheels underneath which are located at the front and back. 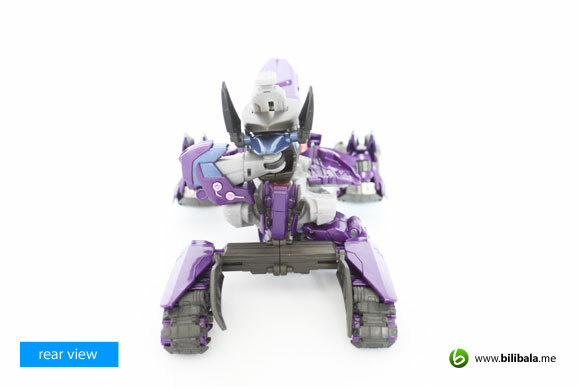 Though having the tiny wheels for the movement, he is actually difficult to be moved around. This is due to the friction created at the rear wheel where the thickness of the treads are a bit too much. This causes the gap allowance of the wheel and the surface is reduced which in turn makes it difficult to move. Another thing which is overwhelmingly noticeable is the big grey button located on top of the cannon. 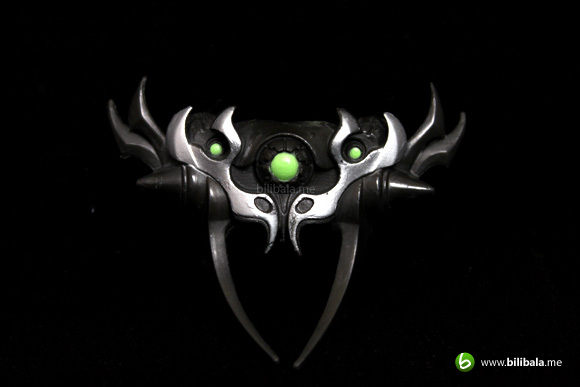 In case you don’t know, that’s the trigger for the Hyperflux cannon spinning gimmick. Will touch more on this in the gimmick section. Off to robot mode. 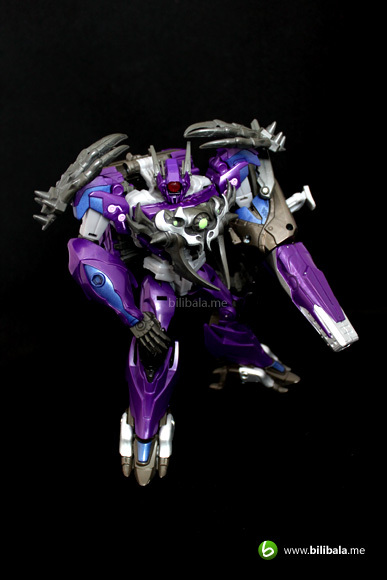 It is very impressive indeed with the combination of the colors, mold and detailing. 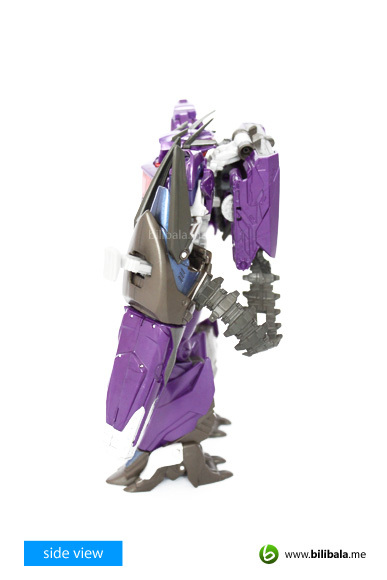 However, one thing that annoyed me is the hip joints are horrendously loose. 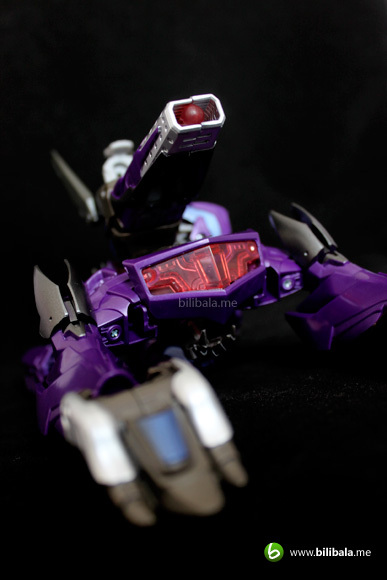 He can easily do a leg split if you are placing him over a more slippery surface such as a glass surface. Thus, posing him might take a bit of effort thanks to this QC problem. Details are really great with those engraved textures on the shoulder and the chest part. Trying closely to reflect the series I must say. 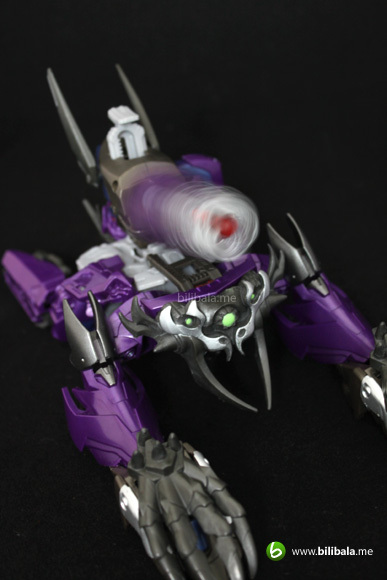 This Shockwave has actually quite a bit of pointy parts which appear in soft plastic. There is actually a missing step in the manual which involves flipping up the 2 spikes to have a more show accurate look. 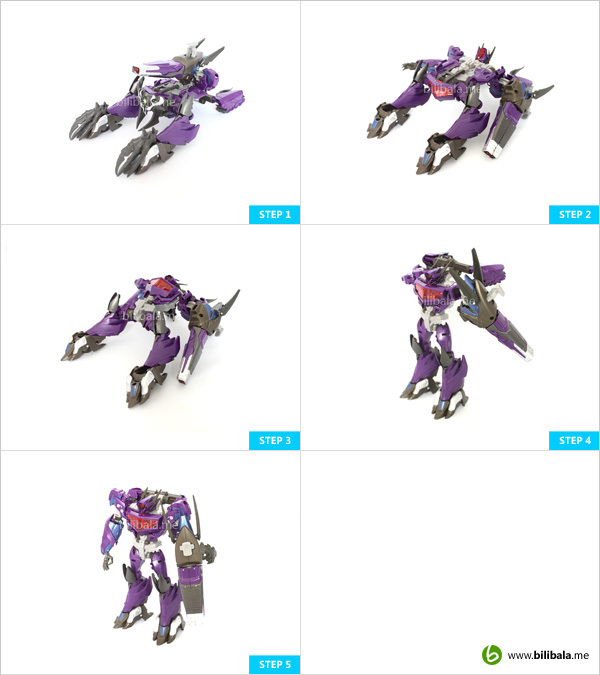 There is no right or wrong anyhow just that I am following the official transformation for my robot mode. The Hyperflux cannon is actually connected via a tank tread. 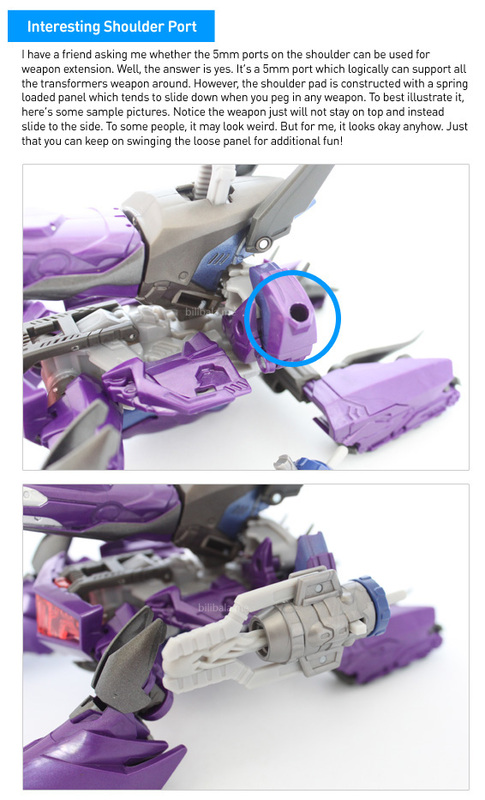 The tread can be easily kept in the small compartment at the back in the tank mode. However, there is only one of the tread (left side) can be used for such configuration. The tread on the other side is pretty much static. 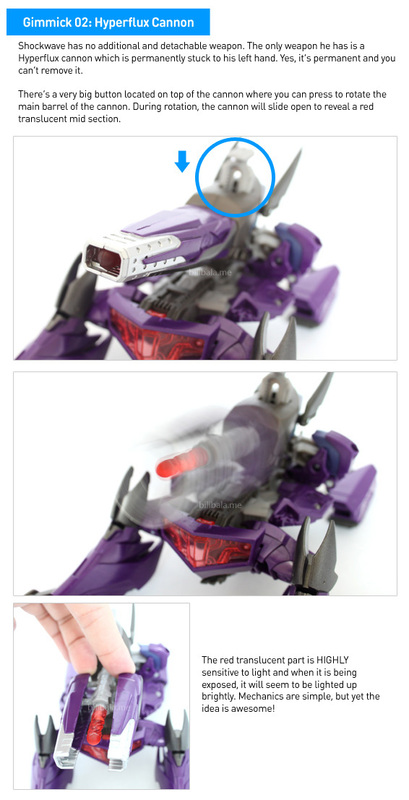 Shockwave does have a back kibble but fortunately it didn’t create much weight and pull the figure down. 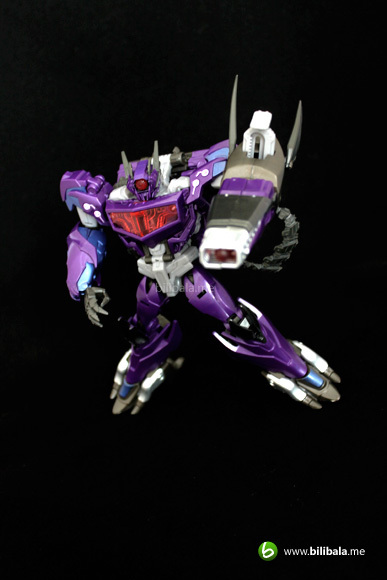 He comes in nicely blended color scheme: dark purple, metallic navy blue, light and dark grey which actually looks much more vibrant in actual figure than in pictures. A close up on the head/torso section. 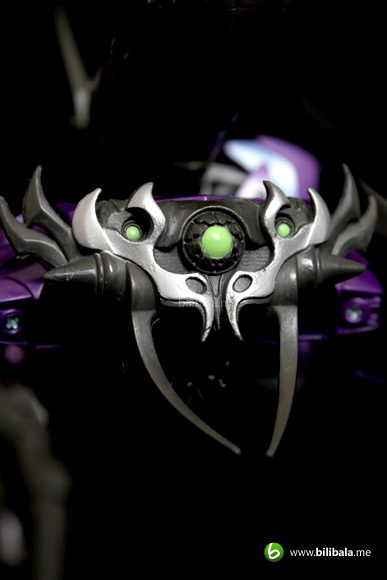 The headpiece is being sculpted nicely with show accuracy. 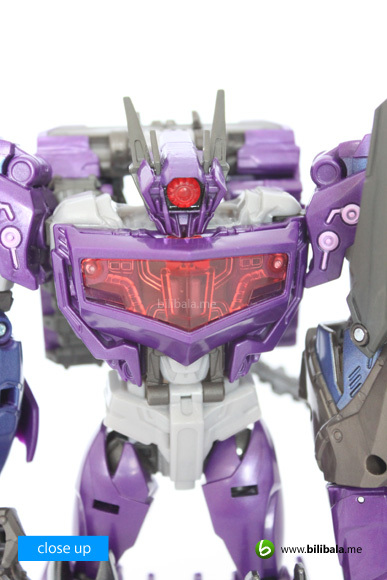 The big red eye is light piped and works very well. I personally like how the treatment is being done to the chest section. 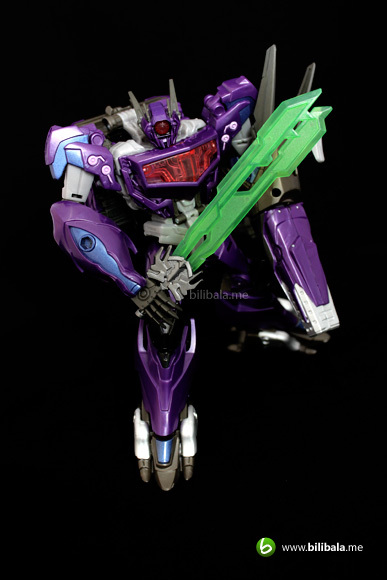 Much like the Fall of Cybertron Shockwave design, he as well shared similar design materials and detailing. 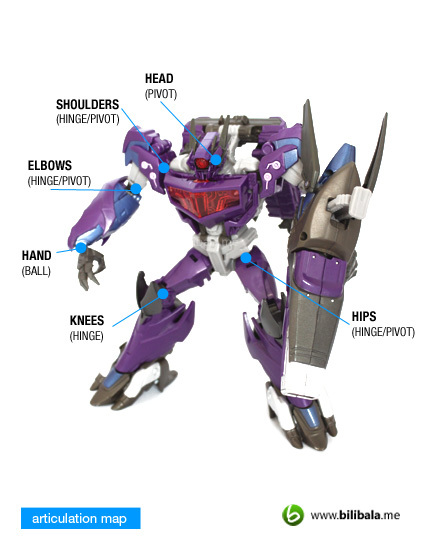 Another which is missing from this figure is the Decepticon insignia. Guess you have to buy and stick on your own. Articulation is pretty standard but with missing waist joint and a ball joint for the head. As mentioned earlier, the hip joints are the annoyed one which suffer from osteoporosis. Can’t really help it. Transformation isn’t that difficult, mostly residing around torso section. 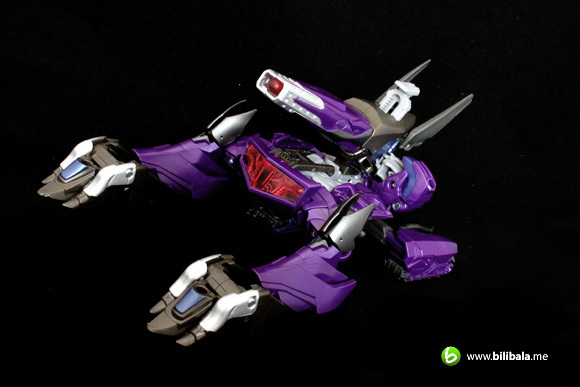 Funny about having the thought of actually making him stand from laying down IS the transformation. 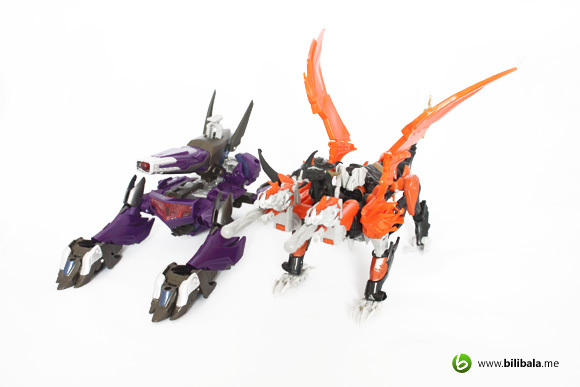 Similar size as compared to the voyager Predaking and of course, if you want a better in scale characters, the ultimate Predaking is the best to have. Poisonous pictures ahead. You have been warned. 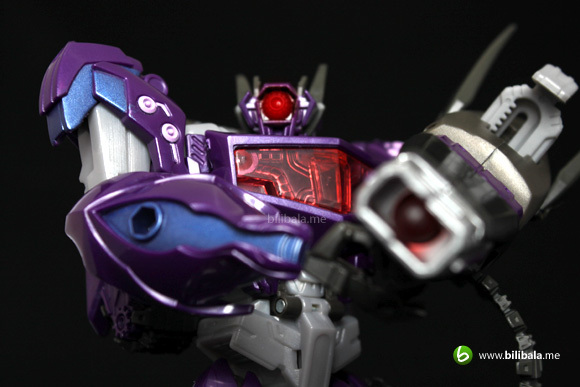 It is a very impressive Shockwave. It might have been a perfect score but sadly due to the loose hip joints, the points have just got to go. 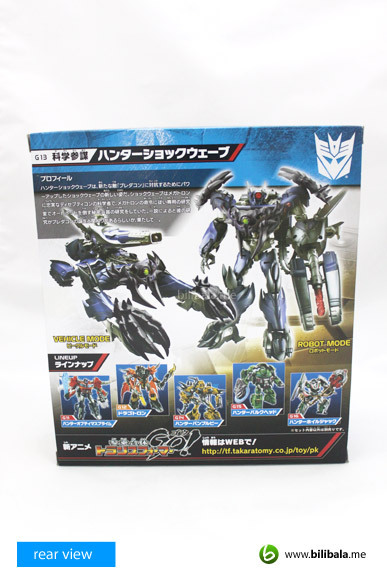 If you are planning to get him, I would suggest getting this Takara version with the better colored plastic, paint applications and the black colored beast armor (red just doesn’t do well IMHO, lol). 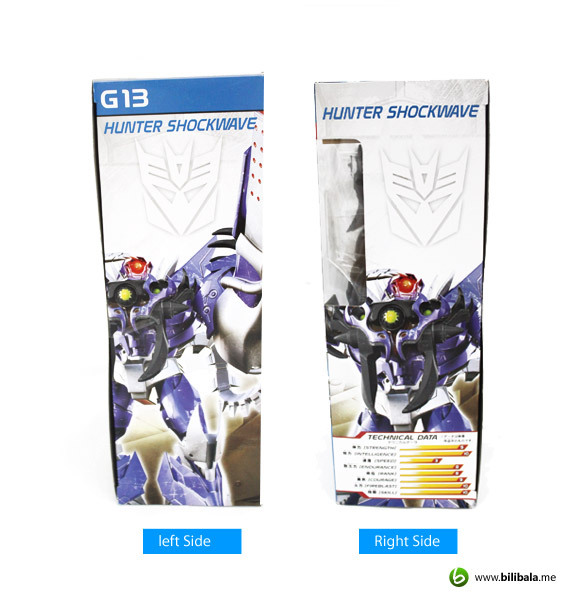 A definitely must get collection for your Transformer Prime fan out there! 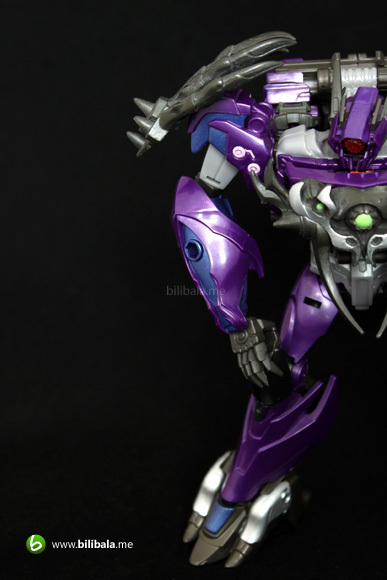 What I like – Great materials used; nice paint application; details are impressive. What I dislike?– Loosen hip joints. Thanks @grayfoxzero ! 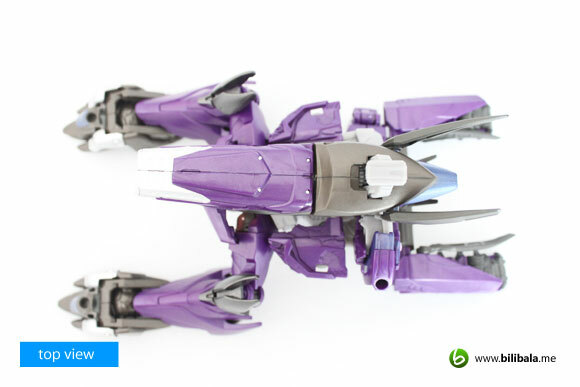 Lol.. yea.. the alt mode does look awkward but that's how it looks like in the series as well. i guess can't do much about it. It still look great IMHO.